Hello. I'm Amrith Ramkumar, getting you set for Tuesday trading. Futures are edging down after a quiet start to the week. Investors are looking ahead to tomorrow's inflation data and Fed minutes following the S&P 500's eighth consecutive advance. Before we see if that winning streak can continue, I explain how the S&P 500 information-technology sector has risen to a fresh record faster than major indexes. Global stocks mostly ticked higher on Tuesday, after the Trump administration took a step toward imposing tariffs on imports from Europe. Investors have embraced software and chip stocks early in the year. A group of the largest technology companies just hit an all-time high, highlighting investors’ renewed faith in software and chip companies after a fourth-quarter rout. The S&P 500 information technology sector posted its first record close since early October on Monday, climbing for the seventh time in the last eight sessions. The group of 68 tech stocks notched a fresh closing record slightly faster than its broader brethren: the S&P 500 is 1.2% below its last record, while the tech-laden Nasdaq Composite is 1.9% off its last peak. As investors have flocked back toward fast-growing companies early this year, technology shares have been among the best performers. The S&P 500 technology group is up 23% in 2019, compared to a 16% advance for the broader index. That’s the sector’s best start to a year ever, according to Dow Jones Market Data. With the U.S. and China closing in on a trade agreement and the Federal Reserve showing caution on further interest-rate increases, investors have once again favored companies that have consistently lifted sales in recent years. Those stocks tumbled during last autumn’s volatility but are back leading the way as investors embrace risk. Monday's record ended the S&P tech sector’s longest streak without an all-time high since July 2017. Before that, the prior record was 17 years earlier at the height of the dot-com bubble. Despite tech’s almost uninterrupted rise to start the year, some analysts expect first-quarter earnings season to test the group. The S&P tech sector is expected to log an 11% drop in profits from a year earlier and a 1% dip in revenue, FactSet data show. And because many tech stocks are associated with market momentum, some analysts caution that a setback on trade or downbeat economic data could send the group tumbling once again. “When people get nervous about the market, those companies pull back,” Mr. Lippert said. Are you buying technology and internet stocks? Let the author know your thoughts at amrith.ramkumar@wsj.com. Emailed comments may be edited before publication in future newsletters, and please make sure to include your name and location. Correction: Emerging markets are popular targets for carry traders because they often offer yields that are much higher than those found in developed countries. Monday's newsletter incorrectly stated that emerging markets offer yields much higher than those found in developing countries. A ninth consecutive advance for the S&P 500 today would mark the index's longest winning streak since November 2004, according to Dow Jones Market Data. About 6.05 billion shares changed hands on NYSE and Nasdaq exchanges Monday, the lowest full-day volume total since September, according to Dow Jones Market Data. Roughly 6.58 billion shares per day changed hands last week, the lowest weekly average volume figure since late November. On this day in 1998, K-Tel International, which sold compilations of old rock’n’roll songs on late-night TV, announced that it would soon begin selling music over the Internet. The stock, which closed at $6.63 the day before, surged to $67.75 by May 4. Within two years, the stock had been delisted from Nasdaq and traded at about $2 a share. The International Monetary Fund releases its World Economic Outlook at 9 a.m. ET. In January, the IMF said the "global expansion has weakened" and cut its forecasts for 2019. The job openings and labor turnover survey for February is out at 10 a.m.
Treasury Secretary Steven Mnuchin appears before House panels at 10 a.m. and 2 p.m. The official topics are Treasury's budget and the international financial system—but don't be surprised if the handling of President Trump's tax returns takes center stage. Fed Vice Chairman Randal Quarles speaks on financial regulation at 5 p.m. and Vice Chairman Richard Clarida speaks on the Fed’s review of its strategy at 6:45 p.m.
Aramco’s bond sale took flight as investor orders neared $60 billion. 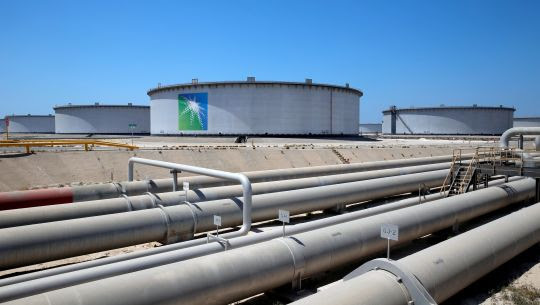 Aramco has won about $60 billion of orders for its closely watched debut bond sale, far outstripping the $10 billion targeted by the Saudi oil giant, as investors appeared to shrug off its ambitious pricing. The Fed is moving to ease “living wills” for large banks. Federal regulators on Monday proposed easing a rule that required big banks to annually plan for their own demise. The chief executives of the largest U.S. banks plan to tell Congress on Wednesday that the financial system is less risky and more tightly supervised than it was before the 2008 crisis thanks to a series of regulatory reforms. The SEC backed a nontransparent exchange-traded fund. Wall Street’s top regulator has paved the way for a new kind of ETF that won’t immediately disclose its investments to the public. Patagonia triggered a panic over new rules on its power vests. The sportswear company announced restrictions on its custom-branded vests to firms that “prioritize the planet,” leaving aspiring tycoons out in the cold. Frackers, chasing fast oil output, are on a treadmill. Shale companies from Texas to North Dakota are managing wells to maximize short-term oil production—and that has long-term consequences for the future of the U.S. energy boom. GE shares slumped as a top analyst downgraded it to “sell” again. General Electric shares fell 5.2% after the company was downgraded to a “sell” rating by JPMorgan Chase, just four months after the bank upgraded its longtime bearish view. The prospect of tougher rent regulations hit NYC building sales. Sales of New York City rental apartment buildings plummeted in the first quarter, signaling the uncertainty around rent regulation after the current law expires in a few weeks. Twitter: Shares of the social-media company have climbed in eight consecutive sessions, their longest winning streak since early June. Zogenix: The company said U.S. health regulators turned down its application for Fintepla, a treatment for seizures associated with Dravet syndrome, a rare form of epilepsy. Symantec: The cybersecurity software company rose 5.4% Monday, its largest daily advance since Feb. 1. The surge came after Goldman Sachs upgraded the stock to buy from neutral. Wynn Resorts: Shares of the casino operator climbed for the eighth consecutive session Monday to their highest level since late August. Monday’s advance came after Jefferies upgraded the stock to buy from hold.